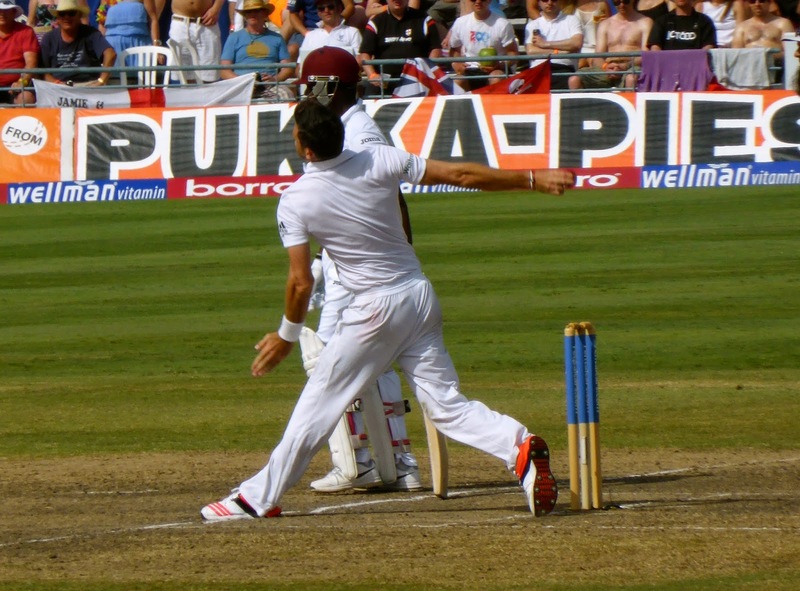 If you enjoy sports travel, you should consider becoming a fan of cricket if you aren't yet. It is a game that is not played professionally in Canada or the US, which means lots of opportunities to travel to exotic locales. I saw the T20 World Cup in Sri Lanka, and the Indian Premier League attracts tourists throughout its season. Other faraway lands in which cricket is popular include Bangladesh, South Africa, New Zealand, and Australia. Of course, the sport's origins are found in England, but that hardly qualifies as an exotic destination. Fortunately, there is a closer and more appealing vacation spot (weather wise at least) that hosts cricket matches on a regular basis: the West Indies. Of course, you probably know that the West Indies is not a country itself, but a collection of Caribbean nations and territories that has been misnamed (it is nowhere close to India) since Columbus first visited back in 1492. 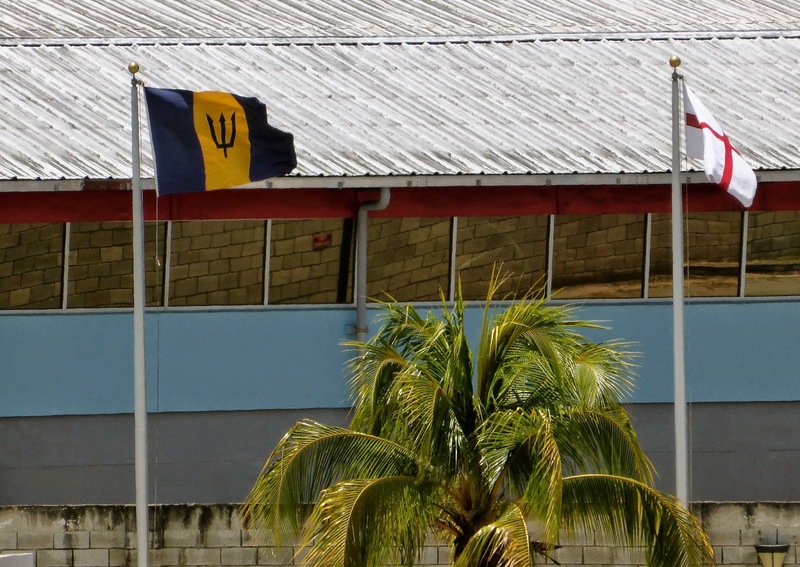 It may not be an official federation in political terms, but it does wield power in the sporting world through its cricket team, known as the Windies. 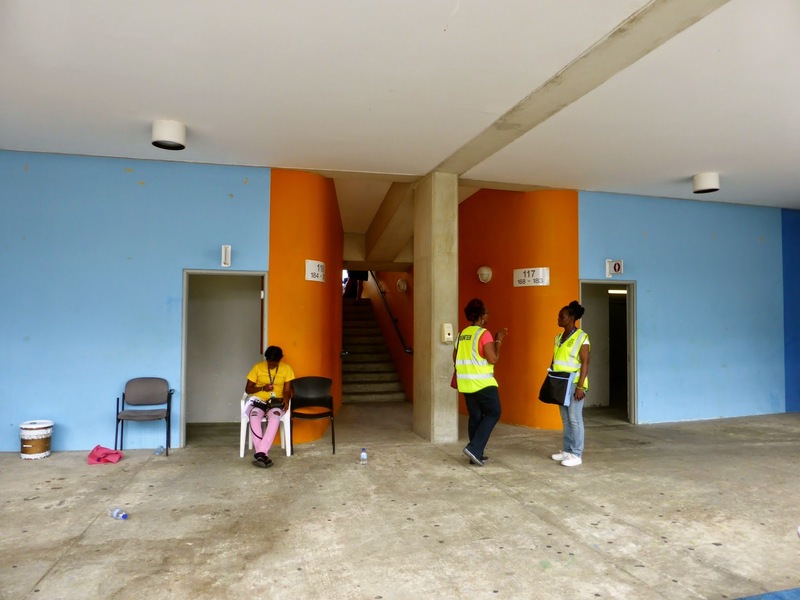 The federation consists of 15 countries and dependencies in the Caribbean and South America. 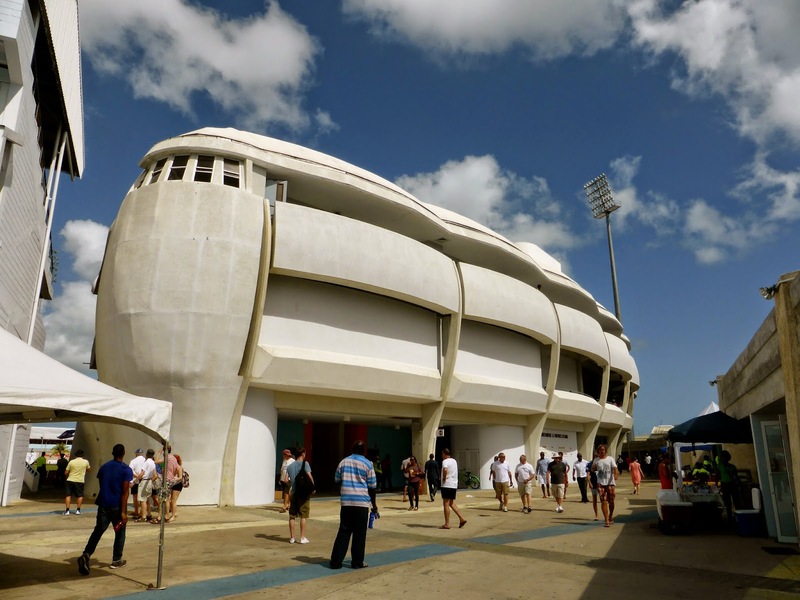 Of these, 10 have a stadium that has been used in an international cricket match: Antigua (2), Barbados, Dominica, Grenada, Guyana (2), Jamaica, St. Kitts, St. Lucia, St. Vincent, and Trinidad. 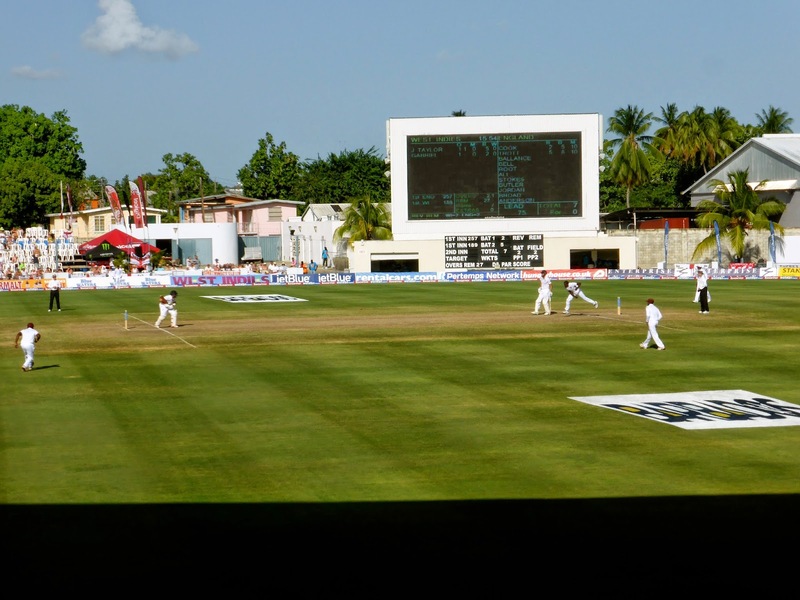 When the West Indies hosts a test series, they will play each test match in a different venue, an ideal situation for a fan who wants to explore these destinations, all of which are easily accessible from the east coast of the United States and Canada. 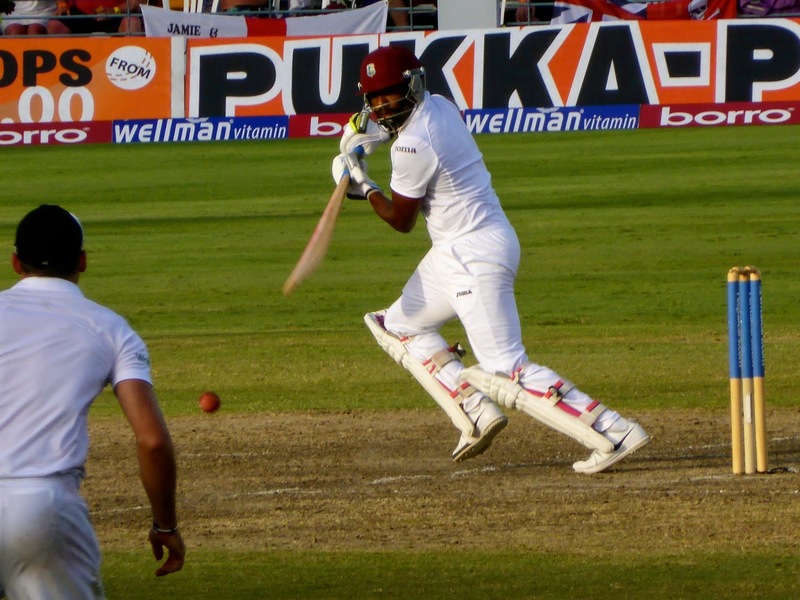 Most recently, the Windies hosted England in a three-test set that began at Sir Vivian Richards Stadium in Antigua (a draw), moved to the National Cricket Stadium in Grenada (England victorious) and finished at the Kensington Oval in Barbados (Windies winning in just 3 days). I happened to spend days 2 and 3 at this final test and found it to be one of the most enjoyable sports road trips I have taken. 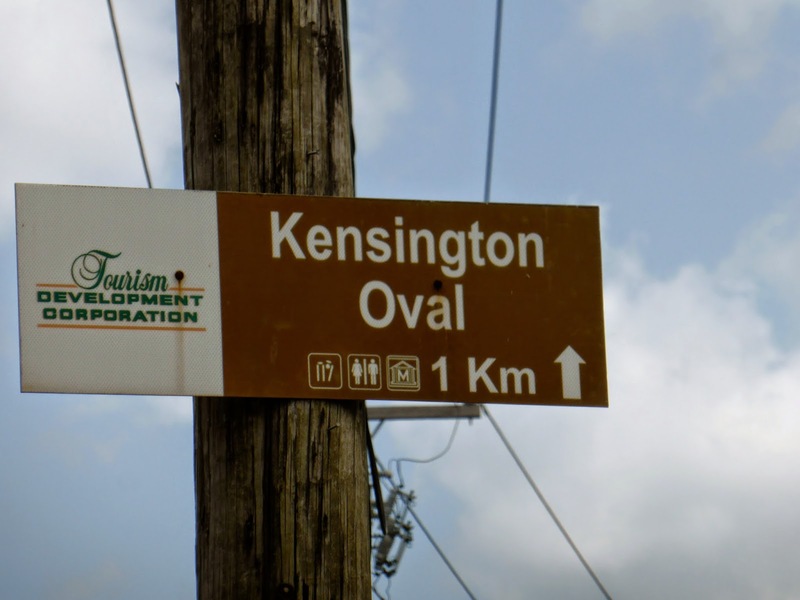 The Kensington Oval was originally constructed in 1871, but was completely rebuilt in 2006 for the 2007 Cricket World Cup. 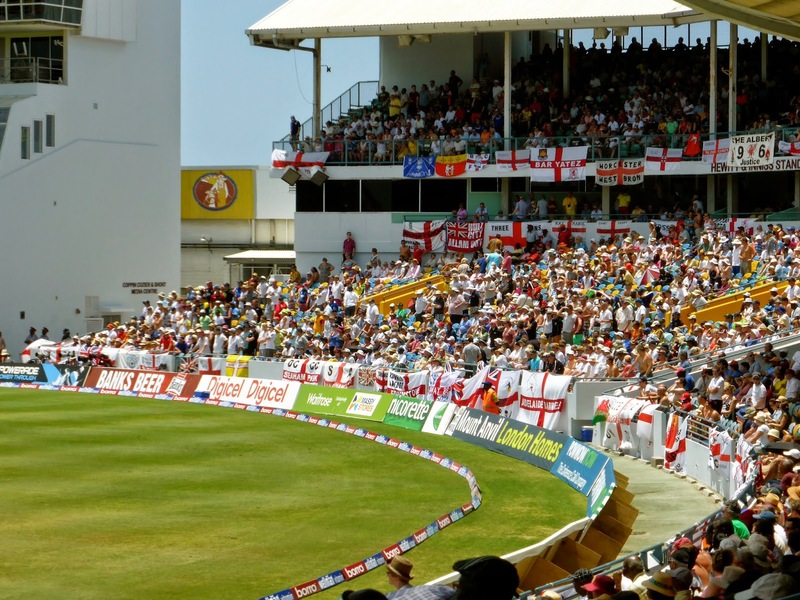 It now holds about 28,000 fans, who are seated in several different stands as is the norm in cricket. 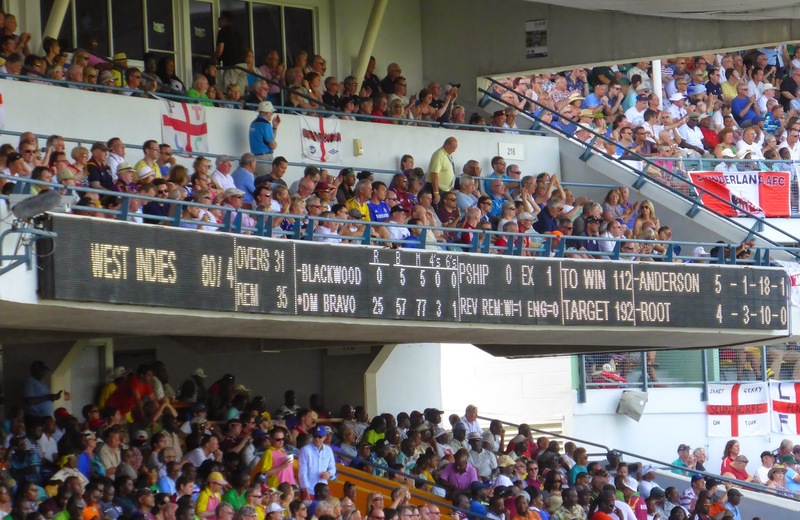 On both days, I ended up in the Greenidge & Haynes Stand which was fortunate as most seats here are covered. Some other stands are completely uncovered (as you can see above), though in some cases you can move over into the covered stand should the sun get too hot. There is also a Party Stand which was significantly more expensive but included all you can eat and drink and was therefore a lot livelier than where I was sitting. The ground is in the southwest corner of Bridgetown, the capital city. It is easy to walk to from the Nursery ZR terminal, taking about 20 minutes or so. ZRs (pronounced Zed-R) are small, white minivans with a red stripe along the side that are your best bet for getting around the island. They are very frequent, driven wildly with music blaring from the loudspeakers, and locals getting on or off every few seconds; in other words a lot of fun. The routes are numbered but not published, however, I found out that the end of the #11 route was close to my hotel and would get me all the way to Bridgetown for a mere $2 BBD (that's a buck in US terms). If you are not up for the walk to the ground, another ZR will take you there for another $2. I didn't even make it to the box office on my first day. As I sauntered down the road, a local had exactly one ticket for sale, for which he wanted $40 BBD. 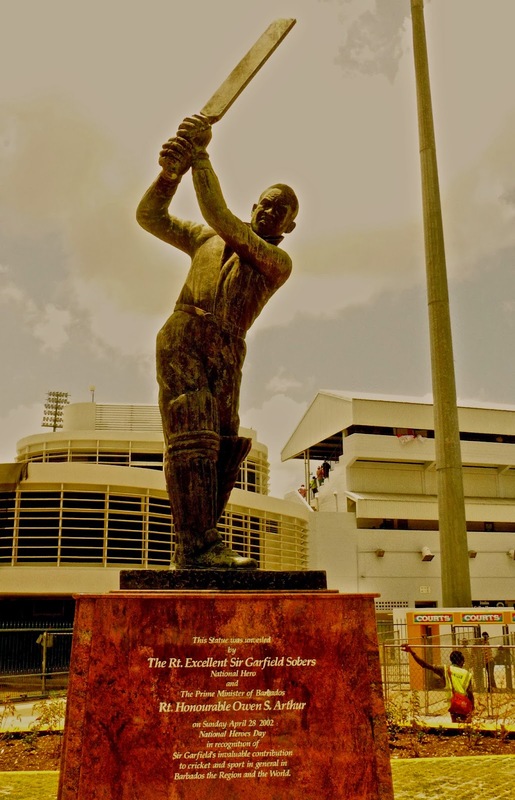 I offered half, we split the difference, and a few minutes later I was inside, stopping briefly to snap a shot of the statue of Sir Garfield Sobers, one of the greats of the game. I was impressed with the number of concessions, most of which are offering similar wares at cheap prices. I highly recommend Mac Pie, which is mac'n'cheese baked into a large pie and served in squares. This local favourite is as good as it sounds and can be found at most bars and restaurants too. It is a good choice for lunch here because it will fill you up for most of the day. 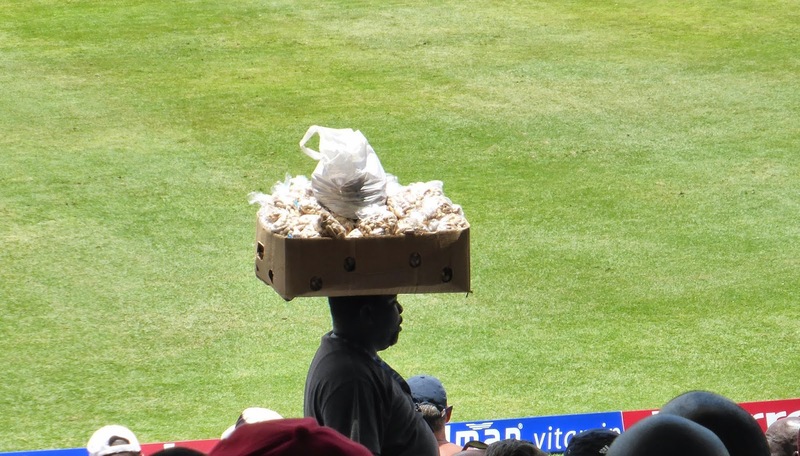 If you don't want to leave your seat, there is a vendor with a box of peanuts on his head. Banks beer was on sale everywhere for $4, though one stand competed well, offering it for only $3. That's $1.50 US for a beer at a sporting event! 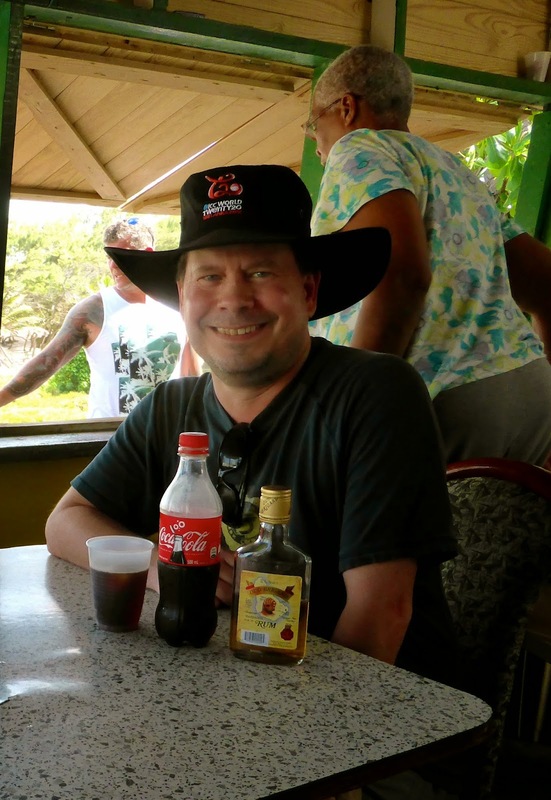 Hell, there were even bottles of rum, gin, vodka, and scotch on sale, in some cases for about the same price as a beer at Yankee Stadium. Hey, cricket takes a full day so you best be prepared. The fans were evenly split between English tourists and locals, and everyone got along. None of the idiotic posturing that you see at NFL games. What makes a day at Kensington Oval so enjoyable, besides the cheap eats and beer, is the weather. Barbados days are consistent, with temperatures around 30C and a light breeze blowing throughout the day. The match unfolds in front of you, slowly but gradually runs are compiled while wickets occasionally fall, and before you know it the day has passed. 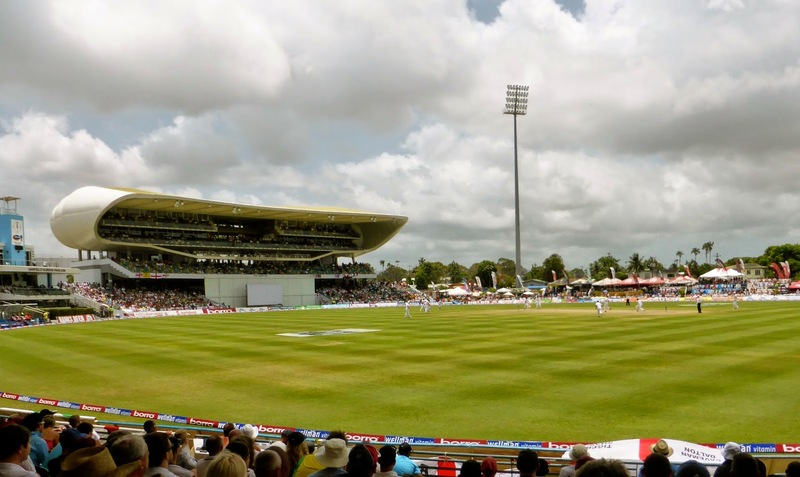 It is a unique experience in the sporting world and Kensington Oval is one of the best places to enjoy that experience. The first day of the test saw England win the toss and choose to bat, where they put up a total of 240/7. By the time I had arrived on Day 2, Windies had bowled out the tourists for 257, and had just lost opener Kraigg Braithwaite for a duck (0 runs). The wickets continued to fall and when Moeen Ali got Darren Bravo to edge to slip, the hosts were only 37/4 and looked to be in serious trouble. 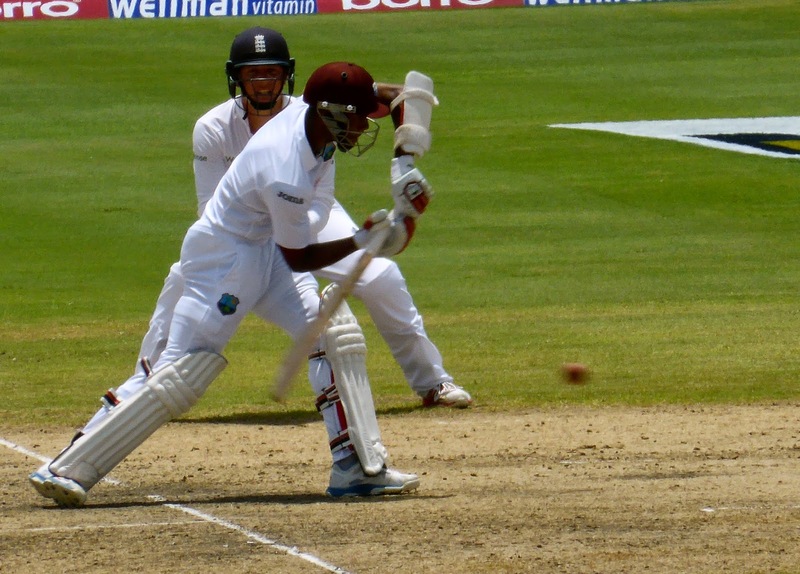 A few steady partnerships solidified the total though, and Jermaine Blackwood finished with 85 as the West Indies finished all out for 189, with James Anderson (below) capturing 6 wickets. There was still time for England to bat, and the wickets didn't stop tumbling. In just 21 overs, England was out five times for a dismal total of 39 and it was clear that a draw was not going to happen. The third day was little better for the visitors. Early partnerships of 23 and 33 got England to 95/7, but two quick wickets left them 98/9 and in danger of falling short of a century. Only some fine batting from Jos Butler saved them from complete humiliation, as his team-leading 35 was enough to get them to 123 all out. That set a total of 192 for the hosts to win, and it didn't take long to see that they would make it as they played defensively, taking few risks and not allowing the English bowlers any easy wickets. The only question was whether they would delay enough for force a morning session on Day 4. At tea, they were only 70/3, but as the close of play approached, they began to bat more aggressively, with Bravo doing the most damage. 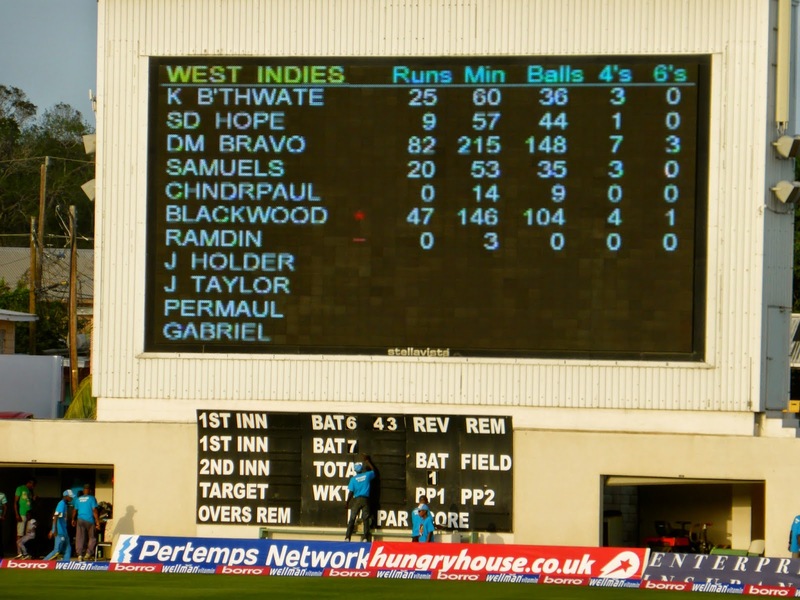 His 3 sixes and 7 fours accounted for more than half of his 82 runs and although he was caught with the Windies just four runs from victory, Blackwood did the honours a few balls later as the West Indies cruised to a 5-wicket win. It was their first test victory over England in 12 attempts and only their second in 29. I was glad to see a bit of an upset and as it turned out, it was nice to have an off day and explore Barbados (or at least bars in Barbados). 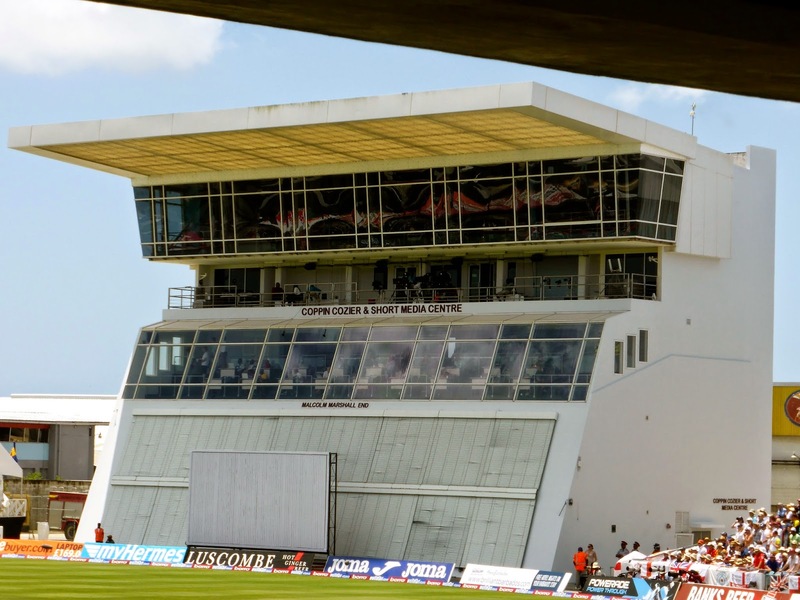 The Kensington Oval is also used in the Caribbean Premier League, which is 20/20 cricket with the Barbados Tridents the home club. The CPL season is very short, running from June 20-July 26, so if you are looking for a Caribbean destination this summer with a bit of sport thrown in, there are also teams in Jamaica, Guyana, St. Kitts and Nevis, St. Lucia, and Trinidad and Tobago. I'm taking this weekend off to recuperate and then heading to Houston to see the Blue Jays. As my luck would have it, the Astros are one of the top teams in the league, so here's hoping Toronto can win a couple while I am there. I'll also check out the Houston Dynamo, some college ball, and maybe the Rockets if they can force Game 7 against the Clippers, so check back in a few days so see how it all turned out.